The present study investigated the effect of menu orientation on user performance in a menu items’ selection task in virtual environments. An ISO 9241-9-based multi-tapping task was used to evaluate subjects’ performance. We focused on a local interaction task in a mixed reality context where the subject’s hand directly interacted with 3D graphical menu items. We evaluated the pointing performance of subjects across three levels of inclination: a vertical menu, a 45°-tilted menu and a horizontal menu. Both quantitative data (movement time, errors) and qualitative data were collected in the evaluation. The results showed that a horizontal orientation of the menu resulted in decreased performance (in terms of movement time and error rate), as compared to the two other conditions. Post-hoc feedback from participants, using a questionnaire confirmed this difference. 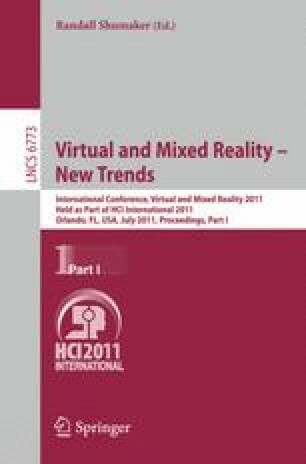 This research might contribute to guidelines for the design of 3D menus in a virtual environment.